The house is all at one level. There is only one step to access the kitchen and the 4 beds bedroom. There are two steps to access the pool. The barbecue has stairs but there is another smaller barbecue next to the kitchen, in the covered terrace. We visited here as a family group in July, the home is brilliant and we had a perfect time. We will defiantly be back. Thank you! We will be glad to receive you again. See you soon! "The pictures provided for the villa were lovely and we knew it would be just what we were looking for and we were not dissappointed, it was even more beautiful than we expected. We had 8 adults in our group and what was so special about the villa was that if you wanted to sit quietly and read a book for example there were so many little quiet areas. The pool was fantastic and everywhere was very clean and very well maintained. We also had access to the owners if and when required. 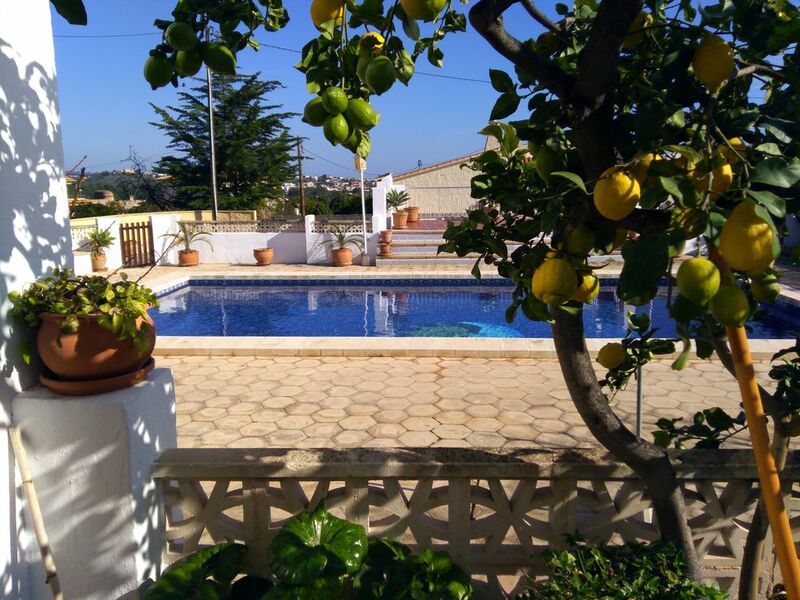 The villa is situated in a very quiet residential area with about a 10 minute walk to the edge of the town." The villa was fabulous. We were a large family group. There was everything we needed at the villa, including toys for my granddaughter. The outdoor space was very impressive , with many lovely seated and eating areas, sheer we could all enjoy spending time together. The pool area was lovely too! The bedrooms were all a good size and the kitchen was very well stocked.. This was a special family holiday and the villa turned out to be the perfect choice! We all had a fabulous time and would not hesitate to return. Villa was even better than we expected. Lovely gardens and pool. Ana and family so friendly and helpful. The beds sooo comfy. Villa had everything you could possibly need. Very traditional and cosy inside. Would highly recommend. Experiencia increible.la casa es impresionante!!! Fuimos a pasar la nochevieja con mi grupo de amigo y la experiencia fue más que satisfactoria. La casa es preciosa, no faltaba detalle y la anfitriona super atenta. Incluso nos dejaron unos detallitos. La recomiendo al 100% tanto para verano con la pedazo piscina como en invierno con chimenea. TAKE THE MOTORWAY A7 DIRECTION ALICANTE OR VALENCIA (DEPENDING ON WHERE YOU COME FROM, IF NORTH OR SOUTH OF THE PROVINCE). TAKE THE EXIT OF BENISSA OR ALTEA. THE NEXT VILLAGE IS CALPE. SYMBOLE OF THE COSTA BLANCA. VISITS TO THE PEÑON DE IFACH. BEAUTIFUL SANDY BEACHES . EXCELLENT SEA AND INTERNATIONAL GASTRONOMIE.